Sad sight: In a very sad state — the boat appears to have been used as a dumping ground. 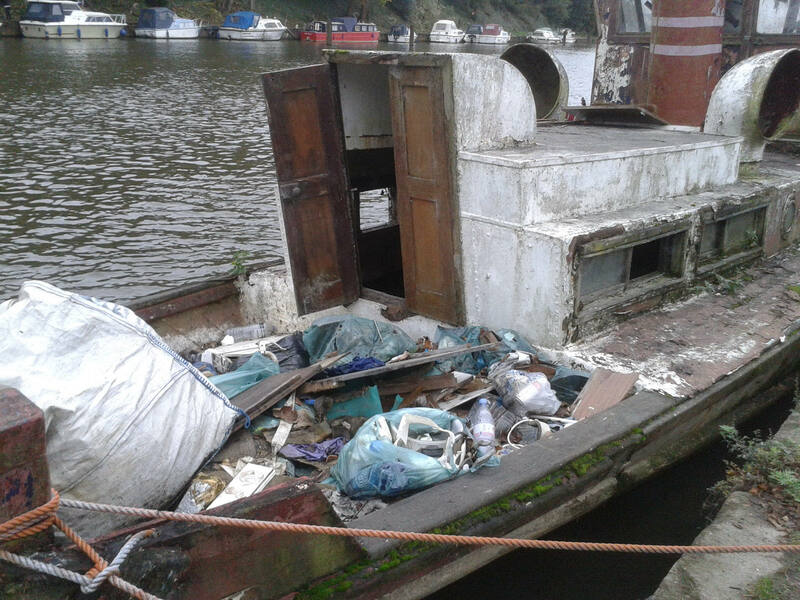 A FEW weeks back, I wrote about the number of derelict and apparently abandoned boats that can be seen up and down the river and wondered why their owners apparently just give up on them. One, in particular, was lying alongside Platts Eyot – or Port Hampton island as it’s otherwise known – almost opposite the Lady Eleanor Holles boat club. This old wooden boat has been in the same spot for many years and when I photographed it for this column, it was clearly sitting on the bottom of the river full of water. So imagine my surprise when reader David Bentley contacted me by email to report that it had moved – to the opposite side of the river close to the Hampton waterworks! David said: “I noticed the other day that it has been dragged across the river and can now be viewed from the car park by the footbridge. Well that makes at least two of us, David. As I wrote last time, she was once a handsome craft – business-like and probably sea-going. So it’s all the sadder that she has been allowed to fall into her current state of disrepair. Personally, I can’t believe that her move across the river is the first step in a restoration process because I honestly don’t think there are enough sound timbers in her to make that a realistic possibility. But I would very much like to know a bit more about her – her history, her age, where she was built and what she was originally used for. If there are any readers out there who can help fill in the blanks, I’d love to hear from you – and so would David Bentley. WORK is now underway refurbishing the barge lock at Teddington – where the tidal Thames meets the non-tidal river. The barge lock will be closed until February or March next year while Environment Agency engineers repair the lock chamber walls and replace many of the old timbers with ekki hardwood. The cost of the work will be around £700,000 and is part of a £3m programme of works taking place over the winter months which also includes repairs to Shepperton Lock. IRONICALLY, the man who is directing these repairs, Paul Power, retires later this month after 10 years working on the Thames. He has overseen the repair and refurbishment of many of the Agency’s major assets on the Thames and that has seen the overall condition of our locks, weirs and moorings improve dramatically. EA waterways manager Matt Carter will miss Mr Power’s expertise. I’d echo that thought – and I’d like to wish Mr Power a very long and happy retirement. What do you do after spending much of your life working on the river? Well go canoeing of course – that’s what Paul intends to do. Have you got a river-related story that you’d like to share? If so, contact me by email at mort.smith [at] trinitymirror.com or give me a call on 07760 361106.